I’m not exaggerating when I say Renaissance Man. Arnold Henry does it all. An overachiever since high school, Henry was the first man from Saint Lucia to be drafted as a freshman into the NCAA Division I for basketball. A talented athlete, it would have been very easy for Henry to rest on his gifts, but his drive and determination have allowed him to recieve a degree in Computer Information Systems and he continues to chase his dreams in writing, speaking, and acting. 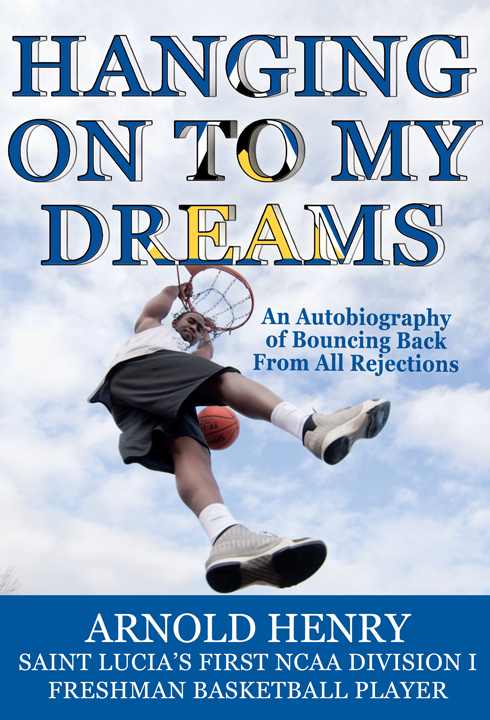 He published his first book Hanging On To My Dreams, his autobiography about his trials and tribulations from childhood all the way to the college basketball court. It’s easily the best autobiography I’ve ever read. I had a chance to talk to Henry a little bit about basketball, his writing, and how he still chases his dreams at this time. If you look at the left hand side, you can link up to his page. Joshua Pantalleresco: What is it about basketball that you enjoy the most? Arnold Henry: For me, basketball is like the person or thing you turn to when you seek excitement or entertainment. I believe that it is the most engaging sport in the world as far as the fan’s involvement and reaction to every single second of the game. It goes beyond just a game; it builds brotherhood and a family among the coaches, players, staff and supporters. 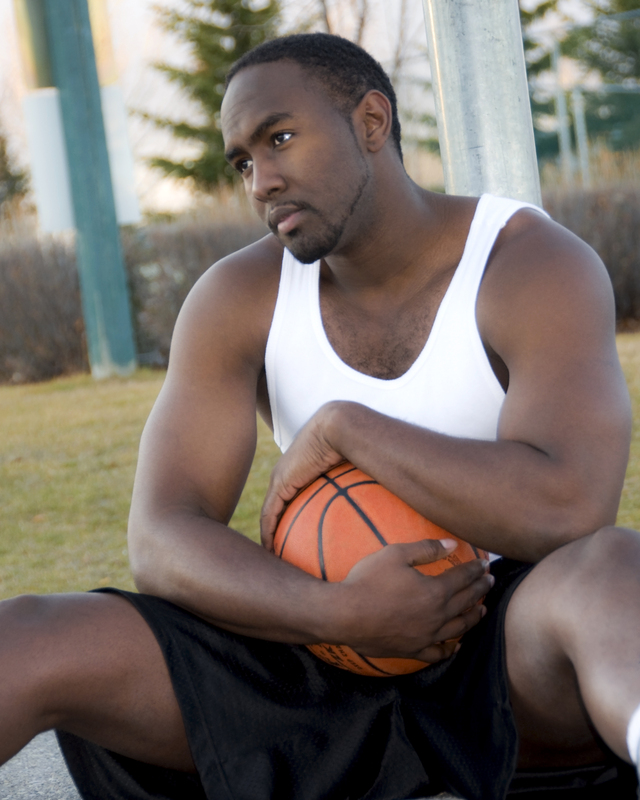 With basketball, there’s always room for skills improvement that can lead to better opportunities that can be life changing; such as full college sports scholarship or a career as a professional athlete. JP: Do you wish you had done more track and field? AH: I never regret the paths I chose in my life. Basketball handed me a once in a lifetime break which is rare being born and raised in Saint Lucia. If I was offered a track and field scholarship before a basketball scholarship, then I would probably writing about my track and field career. In other words, when there’s an opportunity, I like to take my chances. And if it doesn’t work out, then that’s a life lesson to be shared with myself and others. JP: What were some of the obstacles and challenges that you had to adapt to coming to the states? AH: For the most part, I had to assimilate into the American habits; that is, at the very early stages of my arrival, the most difficult situations were conversing with the Americans—coming from an island with a heavy Caribbean accent had triggered communication barriers. And these moments became annoying to a point where I’d received insults by the way I spoke. Also, I had to familiarize myself with racism which goes into more details in my book. One of the most challenging moments was my episodes of being homesick. Of all five schools I’d attended, there were no family members in sight—which meant I had to be spending lonesome holidays such as Thanksgiving, Christmas, etc. There were many times when I felt like I needed to see or hear from my mother, or visit Saint Lucia. On the other hand, I had to adjust myself to playing an American organized basketball system—a territory I wasn’t used to. JP: Why did you turn to writing? AH: My writing habits started at a very early age—at 10 years old. I grew up in a broken home, or rather, a broken family; I felt lonely, unwanted and unloved. Turning to writing was sort of expressing my feelings without anyone being judgmental, or you know that best friend you tell all your deepest secrets knowing that they won’t tell anyone? I’ve been keep journals ever since and it has been a great self-therapy for my depression phases. JP: What is your sequel going to cover? AH: My sequel is still a work in progress. It is going to cover topics such as: never having the courage to confront my biological father about his absence in my life; Dealing with his recent death through cancer; Disowning my youngest sibling; Finding a 34-year old sister from Barbados who I never knew existed; finding love in and my move to Canada; And letting go or still hanging on to my dreams. JP: Your bio says you still want to play basketball in Europe. Is this still a goal? AH: Hanging On To My Dreams isn’t just the title of my book, but it is my lifestyle, though I’ve given myself at least two more years to make this dream come true. Otherwise, I’ll have to fall back on my college degree. JP: What team would you like to play for in a perfect world? AH: In a perfect world, I like to believe that I would be playing for a team in the NBA, preferably, the Miami Heat. Today, one of my favourite teams to support and they just happened to be located in a sunshine state (warm climate). Lebron James and Dwayne Wade, who wouldn’t want these incredible athletes as teammates? JP: What are you working on right now? AH: Apart from working out at the gym 4-6 hours a day, after I am finished with my second autobiography, I plan on stepping out of my genre to venture into a fantasy world and also expressing my feelings through poetry. JP: 4-6 hours in a gym? Can you describe your workout routine? AH: Four hours on a lazy day; six hours on a day when I have the energy. I usually start off my work outs by shooting some hoops, basically working on my fundamentals such as dribbling, post moves, shooting drills, defensive footwork, etc. Then I will work on my cardio: One mile runs, running stairs, cycling or biking and jump rope. Followed by an intense upper body or lower body weightlifting session. And lastly core exercises to strength my abs and lower back. Don’t forget to stretch your muscles before and after every workout. That’s typically my workout routine which someday will hopefully prepare me for the opportunities of a professional basketball contract. JP: Tell me a fun story from your childhood not in your book. AH: To tell you the truth, every fun, memorable childhood moment has been described in my book. There wasn’t too many cheerful episodes because I lived depressing youthful years. At an early age, I was already trying to figure out life…my life. There were many questions I needed answers for. To distract my thoughts, I was on an adventure to chase success—you can say that was the fun story in my childhood—to wake up everyday, go to school and practice, workout on my game. JP: Besides Basketball and writing, are there any other dreams you are still chasing? AH: I’m always dreaming…dreaming big! Besides wanting to live the rest of my life comfortably with God’s guidance, I really want to see my book turn into a Hollywood film. My book, Hanging On To My Dreams, has been transformed into a screenplay by Karen Mueller Bryson (http://www.ahorsewithnoname.com/). And it would be great if I was to play myself in the movie. JP: What is your attraction to fantasy fiction in particular? Does any author inspire you in that field? AH: My whole thing with fantasy fiction is that, I want to venture out of non-fiction to be able to create my own worlds, characters and plots while exploring my own uniqueness and creativity. There’s an idea for a great fantasy fiction that has been floating around in my mind. When I am finished with my second book, I will inscribe that idea on paper. As far as fantasy authors who’ve inspired me, well I am not a big reader in that field so I wouldn’t be able to relate; though, I’m planning to start reading with that genre of writing. Any suggestions? JP: And finally, what kind of poetry do you write? Could you give a sample? I thank Arnold for his patience and his candor. Check out Hanging On to My Dreams and visit Arnold Henry’s site at http://www.arnoldhenry.com. Arnold is an inspiration for anyone to follow. Buy his book on his site. Sorry for the delay between posts. I’ve been busy working on Anomaly and playing Persona 4 entirely too much. I’m past 60000 words and am going to get this baby polished and ready to start playing the lottery that is the publishing biz. It’s time I got recognized for how good I really am. That may sound really overconfident to some people, but the truth is, if I didn’t think I was any good, there would be no need to read anything. So I’m going to say I’m good…most of the time. Work on a comic project is going well. I’ve been very fortunate with the people I’m working with. Tash O’Toole is killing it right now on the project. My only little bit of sadness is that I’m no longer going to be working with Nicki Andrews. Even she though impressed me by recommending a very talented gentleman to replace her. Still, there was something cool about working with three ladies in three continents. I hope I get the chance to work with Nicki on something up the road. I sent a pitch for a film project last night. Fingers crossed. I think this could be a lot of fun. But it’s not up to me if I can do it, but if I can…well…stay tuned. I did a column for Comicbloc last week called All In. You can read it here. Finally, I connected facebook to my twitter thingee. So I hope to be more involved on the twitting thing. Twitting. Can’t believe I said that. I can’t say this will be the last time I disappear, but hopefully it won’t be quite so long. Stay tuned for more chapters of Nemesis’ Great Escape, a great interview an a few more things to come in the not too distant future.